Infiniti QX56 Review: From the very beginning, size has been the ultimate automotive luxury. Even in the olden days, when Duesenbergs wafted the world's rich and powerful down the road, it wasn't just technology and performance that made people notice luxury cars. It was their sheer size. Pull up in a Ford with every high-tech feature in the world, and nobody will care. But pull up in a 21-foot-long, 7,000-pound Bugatti that's powered by a locomotive engine, and suddenly you're the center of the universe. 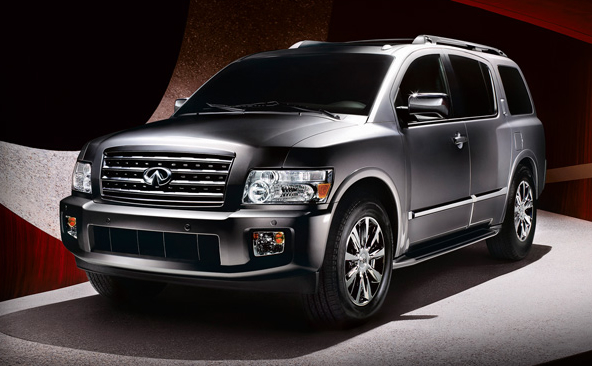 Infiniti takes this to heart with its massive QX56 luxury SUV. A high-end version of the Nissan Armada, it's like driving a despot's megayacht, so gloriously excessive in scale. And that presents an interesting problem. Giant cars are great when gas is cheap, but when regular unleaded spikes at over $4 a gallon like it did last year, suddenly these pavement-crunching luxury barges don't seem so appealing any more. That may have been one of the reasons Infiniti made the unusual decision to strip the flagship status from its biggest vehicle. A much smaller vehicle, the FX50, has replaced the QX56 atop Infiniti's lineup this year, offering more technology and commanding a higher price than its king-size stablemate. Even though it's tiny compared to the QX, the nimble FX tops out around $65,000. The massive QX, with every option box ticked, will only cost around $62,000. It's an interesting reversal. That also forces Infiniti buyers to make a choice: Is luxury about technology and style, or is it about size and power? If you think the latter, the QX56 is for you. It's a very nice luxury SUV, sure enough, with soft leather, a navigation system, back-up video camera and DVD player for the kids. But really, it's all about the size. The QX56 can hold six adults in comfort, or seven if you want to pack them in the three roomy rows. Or if you need cargo space you can press a button to electronically fold down the back seat, leaving a giant cargo area in the back. Powering this house-size beast is a 5.6-liter V8 that makes 320 horsepower. It's not as smooth as a Toyota engine, nor as meaty as a GM powerplant, but it works well in the QX by providing ample, quiet and consistent torque. It never feels too overworked, whether passing on the freeway or accelerating from a stoplight. I spent a lot of time behind the wheel of the QX56 on a road trip to Texas over the holidays, and it seemed like it was built just for the task. It held our whole family, our luggage, our dog, and still had room leftover for all the goodies my kids scored for Christmas. Even better, it was an absolute dream on the highway. It was smooth and silent for hours on end, and the kids kept themselves entertained watching DVDs in the back seat. They wore wireless headphones while Mom and Dad listened to satellite radio on the Infiniti's speakers, thanking God for technology all along the way. In town, it wasn't nearly as pleasant. With a wide turning radius and the all-around heft of such a big vehicle, piloting the QX in heavy traffic on narrow streets was no fun, but that's kinda normal for vehicles in this size class. What was tested? The 2009 Infiniti QX56 2WD with a base price of $55,050. Options on the test vehicle: Tow package at $350, technology package at $1,150 and a rear mobile entertainment system for $1,700. Total MSRP Price as tested including the $865 destination charge: $59,115. Why avoid it? It's been overshadowed by its smaller sibling, the FX50, and has all the disadvantages of big SUVs. Why buy it? 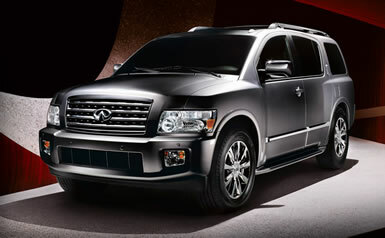 Infiniti's QX56, the high-end version of the Nissan Armada, is for people who see luxury in size. Its massive dimensions make for a wonderful, luxurious cabin with plenty of room to spread out. It's big and spacious, with a soft and quiet ride for the highway. THE BOTTOM LINE: In the end, it�s the combination of size and comfort that make it a winner. This giant highway cruiser may have lost some of its luster thanks to the gas price spike and the high-tech wizardry of its smaller FX sibling, but it still shows why Clark Gable drove a Dusenberg and not a Ford Model T.